and also introduces some new features of GeoGebra. This tutorial will be most helpful if you're trying everything in GeoGebra while you're reading. Note: Things tend to change a bit over time. Some of the information in this lesson may look slightly different on your own version of GeoGebra. However, everything should be similar enough for you to recognize what to do. In the View submenu, a checked item means that it is visible. These work as a toggle; when you click on a checked item, it becomes unchecked. When you click on an unchecked item, it becomes checked. To get a drop-down menu from the toolbar, you must click the small arrow in the bottom right corner of a tool. If you click anywhere else, you'll just make the tool active instead of getting the submenu. 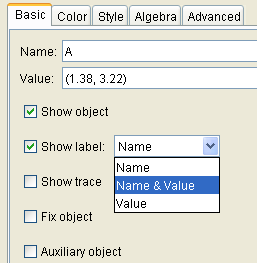 To rename an object, right-click on the object and select ‘Rename’. it automatically renames, if needed, to prevent this from happening. Free objects are ones that can be freely moved with the MOVE tool. Dependent objects depend on something else. Here's a simple example to illustrate the difference. You should now see what appears below: points [beautiful math coming... please be patient] $\,A\,$ and $\,B\,$ are free; MIDPOINT was constructed as the midpoint of $\,A\,$ and $\,B\,$. If you try to move MIDPOINT, it won't budge. The only way to control MIDPOINT is through its ‘parents’ $\,A\,$ and $\,B\,$. If you right-click on an object and check ‘Trace On’, then you can see a ‘trace’ of its movement in the geometry window. Below, both [beautiful math coming... please be patient] $\,A\,$ and MIDPOINT are being traced. To make a trace disappear, uncheck ‘Trace on’. Right-click on an object and uncheck ‘Show Object’ to make it disappear; its label also disappears. Such an object is called a hidden object. Notice that the bullet next to a hidden object is hollow; the bullet next to a visible object is filled-in (solid). GeoGebra has a wonderful ‘undo’ feature. If you ever goof anything up, just select Edit-Undo from the menu. You can undo multiple items. You can redo anything that you undo. The easiest way to get a new GeoGebra window is to select File-New . You are given the option of saving the current file. GeoGebra uses lowercase Greek letters to label angles. For now, you should know the first three lowercase Greek letters: alpha ($\,\alpha\,$), beta ($\,\beta\,$), and gamma ($\,\gamma\,$). Sometimes, labels get positioned in an ugly way. You can use the MOVE tool to adjust the position of the labels. You can display text in the Geometry Window using the ‘Insert Text’ tool, which is in the drop-down menu of the SLIDER tool. Always look in this space to see how to use a tool! Static text is text that just sits thereit is staticit doesn't change. Just type static text in the text box and click the button to accept. Use the MOVE tool to put the text where you want it. Dynamic text is text that changes. It's much more exciting and useful! Quotation marks (",") are very important when you're creating dynamic text. Characters inside quotation marks are displayed exactly as they appear. Outside the quotation marks, a ‘+’ sign is used to put things together. 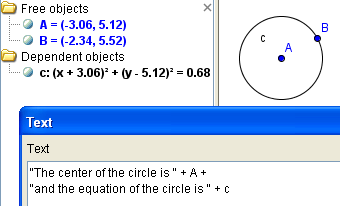 When you type a GeoGebra object outside the quotation marks, its current value will be displayed. In this first example, create a single point, [beautiful math coming... please be patient] $\,A\,$. As you move $\,A\,$ around, the coordinates will change. In this second example, create a line segment from [beautiful math coming... please be patient] $\,A\,$ to $\,B\,$. Move either endpoint and watch the length change! In this third example, use the CIRCLE tool to create a circle with center [beautiful math coming... please be patient] $\,A\,$ and equation $\,c\,$. Move $\,A\,$ or $\,B\,$ and watch the dynamic text change! 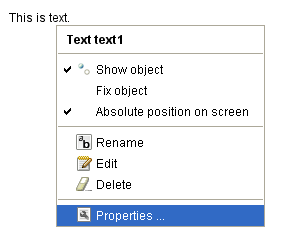 You can change the properties of displayed text by right-clicking on the text box and selecting ‘Properties ...’ . Changing the font, size, and color are all routine. You see the changes immediately in the Geometry Window. Two of the tabs, however, deserve some discussion: ‘Position’ and ‘Advanced’. You can set up text to follow (say) a point around the screen. Get the ‘Properties ...’ box for the desired text. Click on the ‘Position’ tab. ... and as you move $\,A\,$, the text follows! GeoGebra uses x(A) and y(A) to denote the $\,x$-value and $\,y$-value of a point $\,A\,$. Suppose you only want to show an object (like text) when a certain condition is met. You can use the ‘Advanced’ tab of the ‘Properties...’ box to do this! For example, suppose you only want to show text when the [beautiful math coming... please be patient] $\,x$-value of a point is greater than zero. which is greater than zero. which is not greater than zero. Thus, the text is not showing. 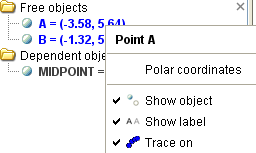 Indeed, every GeoGebra object has its own ‘Properties ...’ box. you can show only the NAME of an object; both the NAME and VALUE; or only the VALUE.